This page will provide a side-by-side comparison of Steelspan Buildings, Inc. versus a traditional pole barn. We encourage you to read all the information as it should answer serious questions about quality and value for your money. 1) What gauge of steel is the building made of? SBI uses a minimum of 22 gauge steel. This is the thickest and strongest steel of any building on the market. It is unmatched for strength and durability and will last a lifetime. 2) What is the structural makeup of the building? SBI are made of 2'W x 10'L panels that bolt together to form a complete arch. There is 100% usable space as there are no trusses, posts or beams. This keeps the building free of birds (and droppings) as there is no where to nest, roost or perch. At last, a clean building. Pole barns have an elaborate skeleton system consisting of posts, trusses, 2x4's, 2x6's, beams, supports and the like. All of this cuts down on usable space, and allows birds to nest and perch. This provides continuous bird droppings on the floor, workbenches, vehicles, RVs, boats, machinery, etc. on a day to day basis. Show me a pole barn without birds! 3) What kind of fastner is used in putting the building together? SBI uses a nut and bolt system--the same nut & bolt throughout the entire building. 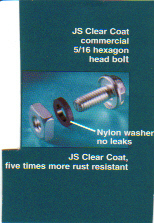 We use a superior nylon washer that never splits or cracks and is not exposed to the sun. The result is unmatched strength and durability that provides a no-leak building forever. Pole barns use a nail (sometimes a screw) with a basic rubber washer. This is exposed to the sun causing rapid deteriation and is also easily split or cracked if overtightened causing future leakage. Obviously, these are not as strong as a nut and bolt system. 4) What kind of foundation does the building have? SBI has a legitimate foundation. It is a simple floating perimeter that anchors the building permantly. It is frost and wind resistant and provides a lifetime of no maintenance. A weather and rodent proof foundation. How nice is that? Pole barns have no foundation; rather they like to use the "fence-post" method. "Dig a hole - stick a post in it - let's attach our building to this." This building will shift and those posts will rot...oh yes, they will. There will be future maintenance. 5) How strong is the building? SBI are the strongest on the market for wind ratings (over 100mph-150mph) and snow loads on the roof. 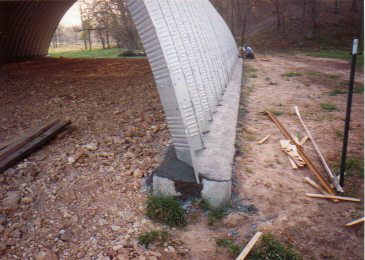 The arch has long been know for its unmatched strength. Ever wonder why a dam has an arch in it? We conservatively say we have twice the strength as a pole barn. 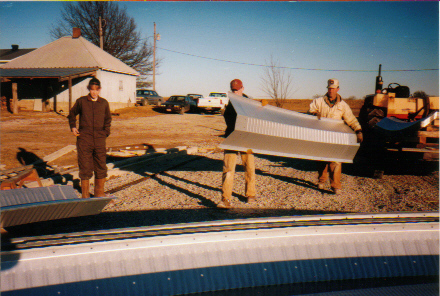 Pole barns-Because there is no foundation along with the use of "aluminum foil" barn tin, makes this type of structure is prone to damage from strong winds, heavy snow and ice accumulations on the roof. 6) How difficult is the building to erect? SBI require no skilled labor, no special tools or equipment, and there is no drilling, hammering, cutting, sawing, welding, measuring, etc. This is a simple nut and bolt project. Most buildings can be built in 1-3 days--this is half the time of a truss building. This saves you thousands by not having to hire a contractor! Pole barns are very labor intensive. A lot of tools, equipment and time is required plus construction skill and know-how is necessary. This is typically not a do-it-yourself project. Labor is very expensive in today's market. If you compare materials vs. materials-which building do you want? 7) Can the building be expanded for future growth? SBI--Our building can be expanded in 2 ft. increments--if you outgrow your existing building, simply buy more arches to add-on. Most add-ons can be done in one day. We also manufacture a special plate to allow the building to be dismantled and relocated if need be. 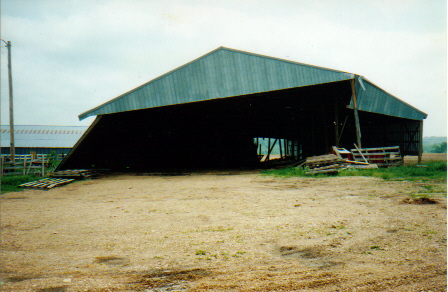 Pole barns--Without a legitimate foundation, most pole barns will shift "out of square" in a short period of time. This makes it very difficult to add-on in length or width. This is very time consuming and labor intensive as well because the original building isn't usually set-up for future expansion. A new or re-inforced truss must be installed to support additional footage. Skilled labor is required. 8) Do I have any maintenance issues with my building? SBI are the strongest buildings on the market, are anchored to a legitimate foundation and are completely obstruction free interior wise. Let me say one more time-no birds or bird droppings! In addition, our steel is guaranteed for 25 years. It reflects heat, it won't rust, fade or discolor like out-of-date galvanized steel, and you never have to paint it. All in all, our building is virtually maintenance-free. 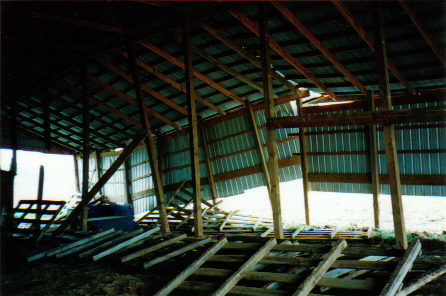 Pole barns are suseptable to wind and hail damage, poles rotting in the ground, heavy snow and ice loads collapsing the building to the ground, and birds. There will be maintenance issues which equal time and money spent in the future. 9) What about insurance costs for my building? SBI have unmatched strength, all steel construction and a concrete foundation-insist upon much lower rates vs. anyone else! Pole barns have no foundation, wood that burns, and wood that termites and carpenter ants love. Inferior structure equals high insurance costs. 10) What is the price of the building? After looking at each building side by side, would you agree that we offer a superior product in quality? What if you could buy our building for about the same price as a pole barn? Would that get your attention? SBI is committed to producing a high quality product at a competitive price and yet still offer twice the building for your money compared to the traditional pole barn. We pleasantly surprise hundreds of customers each month with our versatility, selection, professionalism, and, of course, our pricing! If you could buy a brand new Cadillac for about the same price as a brand new Taurus, wouldn't you buy the Cadillac? If we can help you with a building, please fill out our "Contact Us" page at the end of the tour or call us at (800)894-9408. Last Updated 15 April 2001.